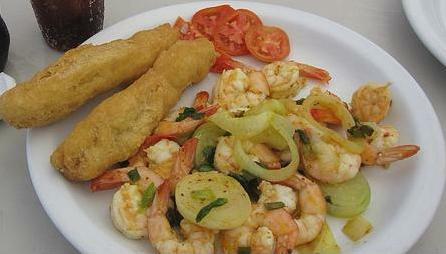 Jamaican Shrimp Dishes & Recipes -Garlic, Curried and Coconut Shrimp! 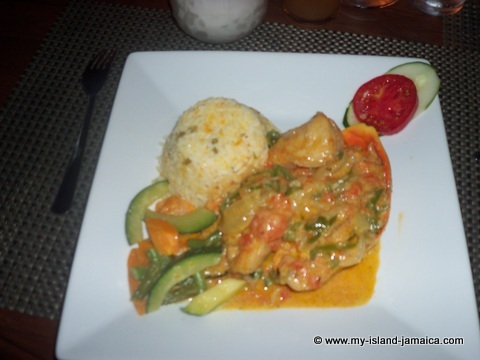 Tasty Shrimp Dishes -Jamaican Style! I love all seafood, but moreso shrimps! Shrimp is treated like a delicacy here in Jamaica. Outside of the cost per pound, it is a very healthy seafood - high in calcium iodine and protein. Shrimp is also healthy for the circulatory system because saturated fat is almost non-existent in shrimp. We actually have a parish (St. Elizabeth) that has a section known as Middle Quarters. That area is famous for its “Peppered Shrimp”. There you will find groups of vendors on the side-walks tempting passers-by with bags of bright red piping hot, spicy, peppered Jamaican shrimp (photo below). From their stalls you can see big pots boiling on wood fire and plastic bowls full of shrimp that they place on well decorated tables to attract buyers. The shrimp here is usually boiled in salted water laced with crushed scotch bonnet peppers. These spicy and salty flavours complement each other perfectly when it is absorbed by the shrimp. 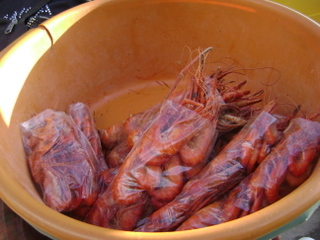 Most of the vendors catch their shrimp in the nearby Black River. But like any other seafood the shrimp can be prepared in many other ways. 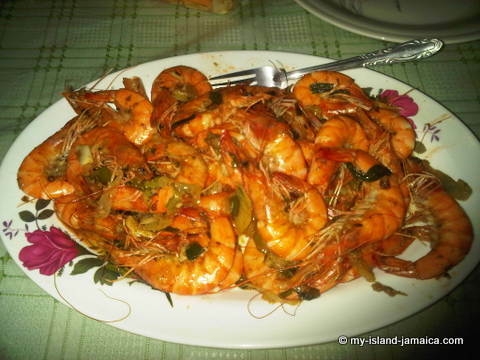 I will outline a few of the ways we prepare shrimp here in Jamaica. 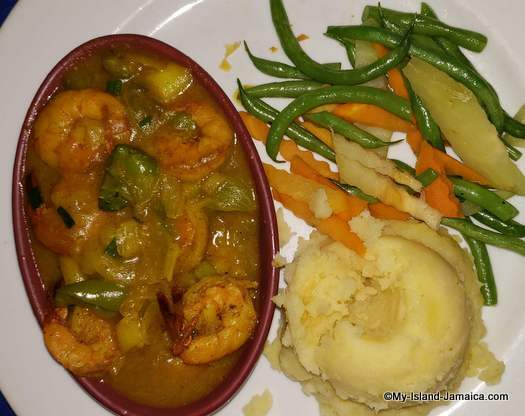 Curried Shrimp is a simple and quick meal that can be prepared in only a few minutes, and like all the other shrimp recipes this is one of the most popular and the favorite way that Jamaicans prefer to cook there shrimp. This method is mostly served with plain rice. Shrimp Scampi, is also very simple and easy way that shrimp can be prepared. It is made with plenty of butter and garlic, onions, white wine, lemon juice parsley and seasonings. If you like shrimp and love garlic then you'll love Garlic Shrimp. It is also another simple but tasty way to prepare shrimp as the burst of garlic in this recipe will certainly make your taste buds come alive. Coconut Shrimp is a crunchy, juicy, delicious dish that can be served as full meal or just as an appetizer. 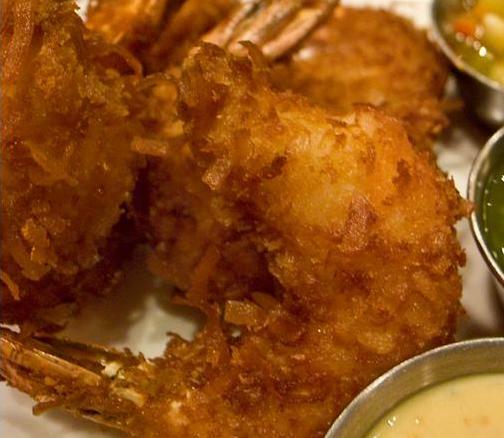 The shrimp is dipped in coconut and deep fried until it is golden brown. I guarantee that your friends or family will be asking for more . Here the shrimp is dipped in batter and fried to perfection in a pan over high heat. • Mix together grated coconut and curry powder. • Dip each shrimp into batter then into coconut mixture. • Fry coconut shrimp in heated oil until golden brown. • Combine shrimp, minced onions, crushed garlic, 1 tsp. of the curried powder, black pepper and salt in dish. • Hot sauce pan, add oil and the remaining 1 tsp. curried powder, and allow the curry to soak in the oil. • Add shrimp, stir and cover for 3 minutes. Serve with white rice and enjoy……. • Rinse shrimp and set aside. • Heat butter in large skillet over medium heat. • Cook garlic for 1 or 2 minutes or until tender, but not browned. • Add shrimp, onions, salt, and pepper, wine and lemon juice, cook until shrimp is firm, do not overcook. • Add chopped parsley before serving. Serve this wonderful scampi with as a first course or serve with rice, pasta and a salad for a complete meal. • Add shrimp and garlic and sauté over medium heat, turning frequently, until the shrimp turns pink. • Remove the pan from the heat. Serve immediately with rice, pasta or salad.